I wanted to give a special thanks today for our military men and women. I have always been so proud of this country, but it wasn't until I married into a family that is all in the Army that it hit me how much of a sacrifice it really is. I am so proud of Derek, his brothers ( Matt, Brent, Bryan, Devin and Travis), and our friends that proudly serve this country. I still remember when Derek and I were engaged and he asked me how I felt about him joining the military. It really didn't come to much of a surprise, and I was proud that he would be so selfless. Being in the military has been no picnic, with alot of ups and downs. Tears have been in plenty, but I have also been blessed. I never would have been able to handle Derek being gone with out the support of my family; especially my sister in laws Jennie, Brittany, Natalie, and Michelle. Thank you again to all of you willing to make the sacrifice to keep our country free. 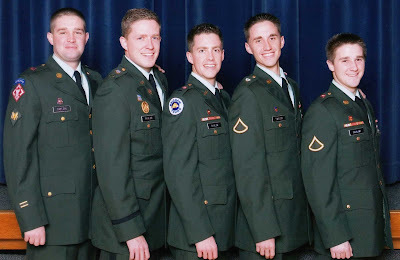 what a neat neat family legacy, wow, to see all those brothers in uniform is so cool! Thank you to the Taylor family!